MUMM’S brand Sprouting Seeds – Sunflower as described below are recalled because these products may be contaminated with Salmonella bacteria. This is an update to my previous blog Health Hazard Alert: Certain MUMM’S Brand Sprouting Seeds – Sunflower Recalled. and may have been distributed nationally. OTTAWA, April 4, 2012 – The public warning issued on March 30, 2012 has been expanded to include additional product information. 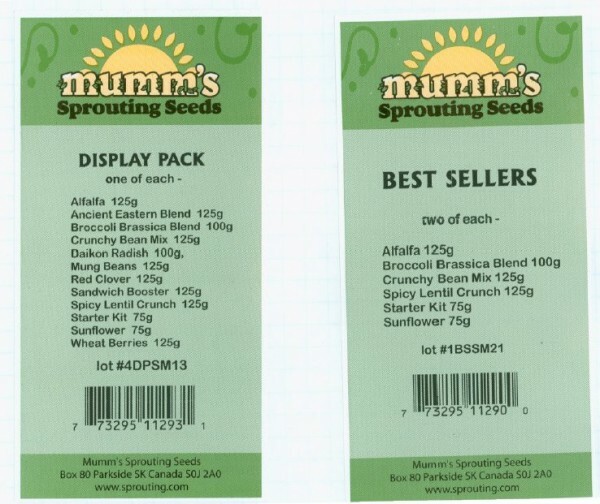 The Canadian Food Inspection Agency (CFIA) and Mumm’s Sprouting Seeds Ltd. are warning the public not to consume the Mumm’s brand Sprouting Seeds described below because these products may be contaminated with Salmonella. These products are known to have been distributed in British Columbia, Saskatchewan and New Brunswick and may have been distributed nationally. OTTAWA, le 4 avril 2012 – On a élargi la portée de la mise en garde du 30 mars 2012 afin de fournir d’autres renseignements sur les produits. L’Agence canadienne d’inspection des aliments (ACIA) et Mumm’s Sprouting Seeds Ltd. avisent la population de ne pas consommer les produits Sprouting Seeds de marque Mumm’s décrit ci dessous parce que ceux ci pourraient être contaminés par la bactérie Salmonella. Ces produits ont été distribués en Colombie Britannique, en Saskatchewan et au Nouveau Brunswick, mais ils pourraient aussi avoir été distribués à l’échelle nationale. Author editorPosted on April 6, 2012 April 6, 2012 Categories Community, Health & WellnessTags canadian food inspection agency (cfia), may be contaminated with salmonella bacteria, mumm's brand sprouting seeds - sunflower, mumm's sprouting seeds ltd.